Throughout the intensive program the classroom teacher will co-facilitate the program with another KooLKIDS trained professional at the school. The classroom teacher will deliver the five class sessions of the program to their class and the co-facilitator will deliver the intensive part of the program to the student that requires intensive support. The teacher will be trained by the school's KooLKIDS Facilitator and will be provided with an overview of the Intensive Program, the session plans that include the facilitator's script, the teacher tip sheets and all other resources needed to deliver the program. 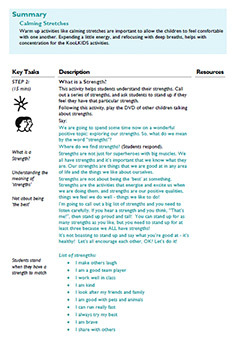 The teacher tip sheets have been developed around the 'KIDS' acronym. Demonstrate a capacity to be flexible with the materials and adapt the program to suit the particular classes and children with whom they are working. The training workshop covers topics such as the KooLKIDS model, emotion regulation, social emotional learning, emotions, learning and the brain, early intervention, cognitive behavioural strategies, life-mapping, role-playing, and content specific work. The teacher will have access to all of the KooLKIDS resources including a fully scripted facilitator's script to refer to throughout the sessions.